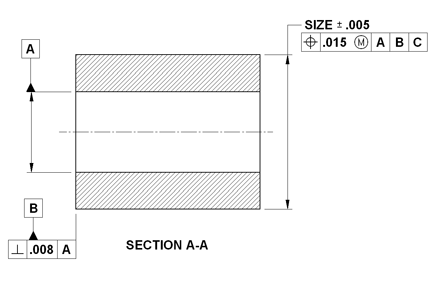 External feature of size Maximum Material Condition MMC Size Calculator for shaft and other similar features. This calculator tool will create a Geometric Size vs MMC Maximum Material Condition Tolerance Chart per .ASME Y14.5-2009, ASME Y14.5M - 1994, or ISO 1101 Geometric Dimensioning and Tolerancing (GD&T). Virtual Condition = Tolerance boundary that is constant for all sizes and generated by the cumulative effects of size and geometric tolerance at MMC. For an external feature of size with MMC specified, Virtual Condition = MMC + Geometric tolerance, or as-manufactured size + allowed geometric tolerance at that size. Resultant Condition = Worst case tolerance boundary generated by the cumulative effects of size and geometric tolerance. For an external feature of size specified at MMC, Resultant Condition = LMC - Geometric Tolerance allowed. This is a single tolerance and size event.